Crimpers make the potentially difficult task of finishing coil binding easy and effective, and these Premium Spiral Coil Crimpers are GBC's most popular pliers for smaller coil sizes (6mm to 16mm). In one motion, they both cut and crimp coils preventing them from spinning off the book. The red dot on top makes sure you always cut and crimp correctly. If you're doing any sort of binding with smaller coils, these crimpers from GBC are essential. Great tool for crimping ends of coil. For being a glorified pair of pliers, they're incredibly expensive. I feel like I was mislead with the description. 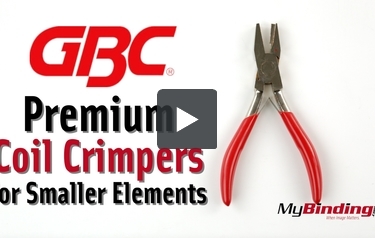 Time saver Review by Julie L.
These GBC coil crimpers with the longer throw are a great time saver. I do a lot of 6mm coil binding and wanted the longer tail versus the standard coil crimpers. Well made, work well, although you must make sure to position them correctly or you will accidently cut the coil off without the bend. Thank you for your question. Unfortunately we do not have a pair of crimping pliers that are designed to be used with metal coils. All of the crimping pliers we carry are designed to be used with the standard plastic binding coils. Does this tool cut wire coils or just plastic coils? Thank you for your question. This item is designed to cut plastic coils, it is not designed to be used with wire. Do these work with larger sized coil (larger than 16mm)? The GBC Premium Spiral Coil Crimpers For Smaller Elements will work with larger elements as well as the smaller coils. The head of the crimpers is narrower to work with the smaller coils but that does not hurt it's ability to work with the smaller coils as well.